In a bowl, stir together the ricotta, pumpkin 1 1/4 cups of the flour, cheese, eggs, salt and pepper until just combined – using a rubber spatula. Add the remaining flour 1 tablespoon at a time until the dough comes together, form a ball. Press it into a disk on a floured surface and cut it into four equal pieces. Take each piece and roll it into a log about 16 to 18 inches long. Cut 1-inch pieces with a sharp knife. To cook, bring a pot of salted water to a boil. Once it’s simmering, add the gnocchi and cook about 2 to 3 minutes, until it floats for about 30 seconds. Remove with a large slotted spoon or sieve to drain. 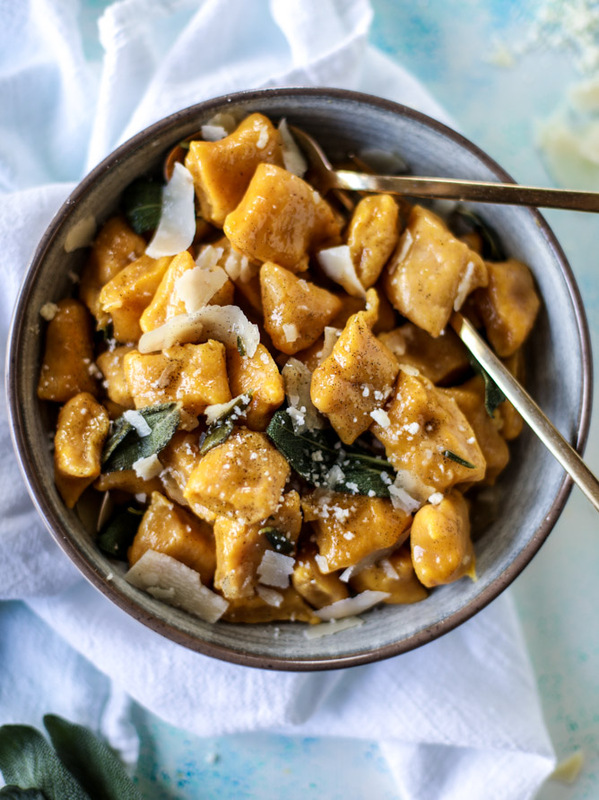 Toss the gnocchi with the brown butter, fried sage and shaved parmesan. Serve immediately. Heat a saucepan over medium heat and add the butter. Immediately begin whisking. Stir as it bubbles, and after 2 to 3 minutes or so you should see brown bits appear on the bottom of the pan. Remove from heat immediately and add in the vanilla beans. Continue to whisk for another 30 seconds. Place the butter in a skillet over medium heat. Once melted and sizzling, add in the sage leaves and cook for 30 seconds on each side. Remove them and place on a paper towel to drain excess butter.